I had a challenge while at art school to take something I enjoy and make a product out of it. So I smashed the two together and made an awesome project, at least in my eyes. 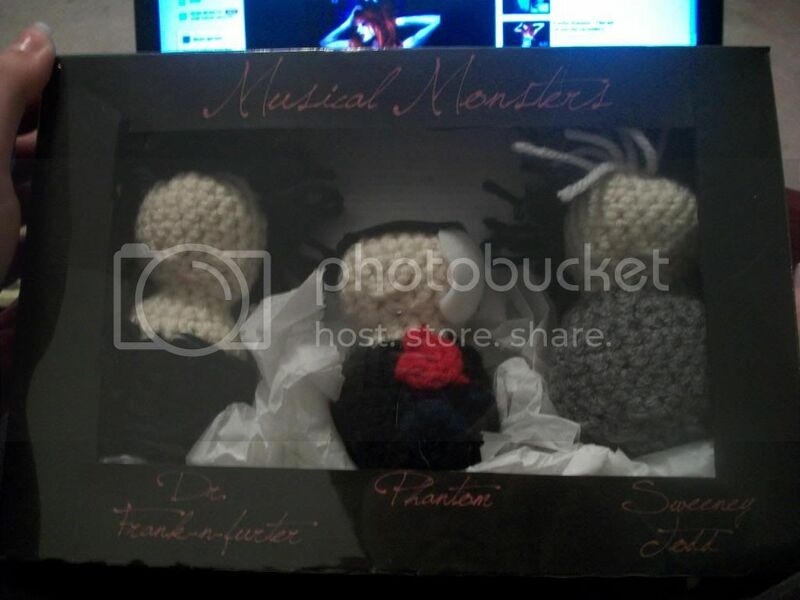 "Musical Monsters", "Dr. Frankenfurter", "Phantom", and "Sweeney Todd." The top says "Fallen in love with a monster? Dark and brooding, mysterious... But still so soft and cuddly!" Made with yarn and felt. The box is a UPS box that I cut a hole in, painted, and glued the things I made in Photoshop on it. Then I shrink wrapped the entire project. I am extraordinarily proud of this project, regardless of it being like... Over three years ago. I love this. I am so happy my dad was able to find it for me again after moving.